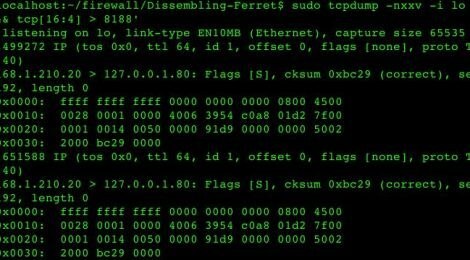 Browse: Home / Dissembling Ferret – Exploiting covert channels in the TCP/IP protocol suite. Dissembling Ferret is a Exploiting covert channels in the TCP/IP protocol suite for blue teams to validate security assumptions and vendor claims with respect to defensive technologies. * A plus sign next to the item means the code has been written for the test. + If we use a rogue DNS server then we will likely be detected. +-+ Spoof source with destination of 8.8.8.8. + This method is louder than previous methods but can still be obscure and difficult to detect. – Ipid – RFC6864 – Updated Specification of the IPv4 ID Field. – Protocol Headers Test with IP, TCP and DNS. – Syn Packet Scans: SYN packets various applications send when initiating and establishing new connections. -+- live mode will send 1 packet per second 3 times, once a minute (adjustable)??? – Add TODOs to the issue queue on github. ← Auditing tool for PI Security.